At Footwear Supply, we want you to be satisfied with your purchase! We hope that your purchase is exactly what you wanted, and that it fits perfectly! If not, then by all means send it back to us within 30 days from the original date of purchase! 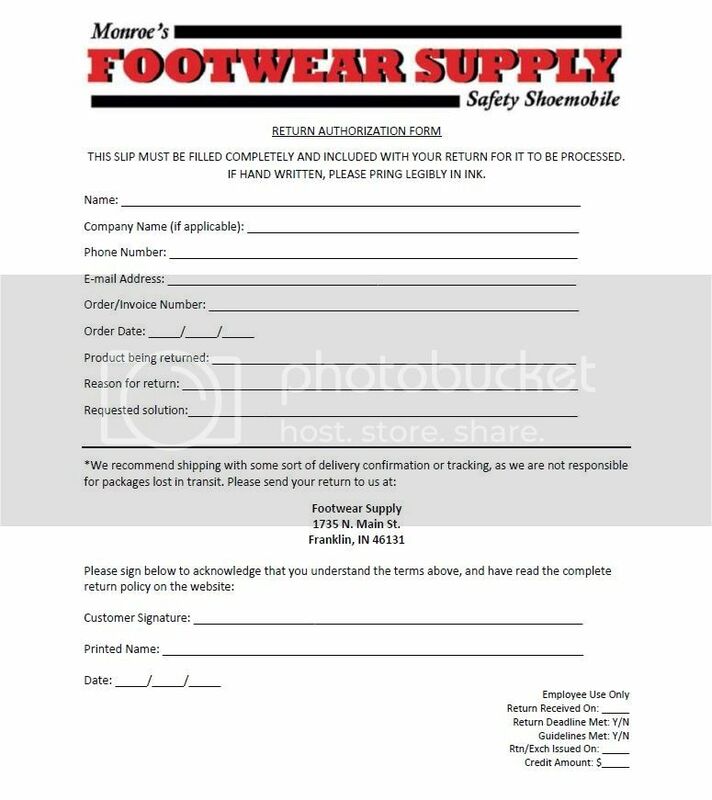 To return your merchandise, please download the Return Authorization form, and include it with your return. If the Return Authorization form is not enclosed, your return will not be processed. If for any reason your are unable to download the form, please contact us via email at: monroeoptical@hotmail.com or by simply calling one of our associates to have the form sent to you. We like to think we are pretty smart people, but when we receive a random product in the mail without a Return Authorization form we won’t have a clue who the return belongs to or what result you are seeking from sending the item back. We'll send you an email that confirms your return/exchange and provides you with a record of your request. When we receive the item you've returned in the original box, in like-new condition, we'll get your replacement item shipped or credit issued quickly as we can. PLEASE NOTE: Returns are limited to one per customer every 30 days. All returns must be received within 30 days of the original order date. Specially priced, sale and close-out items are not eligible to be returned or exchanged. We reserve the right to refuse returns at our sole discretion. Returns may be granted at the discretion of our customer service department. IMPORTANT: Returned items must be in like-new condition. You MUST return the item boxes in the condition you received them in. For example, please place the footwear box inside another box. Do not use the footwear box itself for shipping the item back to us. If the footwear box is not included in your return shipment, is damaged, taped or otherwise unusable for resale, we reserve the right to charge you a $10.00 service fee to replace the box. Any credit you receive will be for the original purchase amount of the product(s) and any applicable sales tax. We aren’t able to refund any shipping costs since these are paid to a third party. Please contact customer service for any additional questions or for more information on returning an item. Thank you.